The Health Service Executive has said it has met with Dublin city businesses about the opening of a Supervised Injection Facility for drug users which is due before the end of the year. In a statement a spokesperson for the HSE said that the plan is to open the facility in the city centre area "where there is the preponderance of drug related deaths, drug related litter, ambulance call out for overdose and most visible public injecting scene". The statement added that the contract would be awarded to the the organisation that demonstrated a "robust" plan for the involvement of local residents and businesses. Tony Duffin of the Ana Liffey Drug Project has been campaigning for the injection facility for a number of years, saying it will reduce overdose deaths, the spread of diseases like HIV, and connect drug users with treatment services. But business groups have expressed concern, with DublinTown saying that the injection facility should be a mobile one and kept away from the main retail area in the city centre. The Temple Bar Company has expressed concern at the policing of the area around the new facility given that the law will create authorised drug users who will be bringing drugs with them. CEO Martin Harte says drug dealers could avoid prosecution by claiming to be clients of the centre and that this would create a "honeypot effect" in terms of drug activity in the vicinity. But supporters of the facility say this has not been the experience in other countries. The Government has given the HSE €750,000 to set up the centre which is expected to cost €1.5 million a year to run. It is estimated there are around 400 drug users currently injecting in laneways around the city centre and it is envisaged that the centre will be open 12 hours a day, seven days a week catering for around 16 drug users at a time. It will not cater for users who smoke heroin or crack. 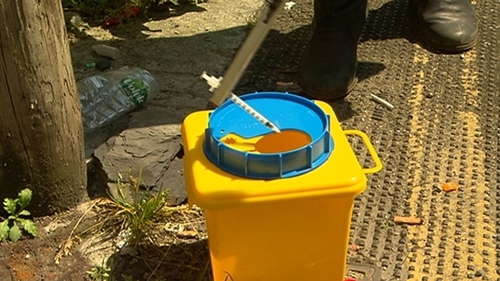 The HSE points out that there were 25 deaths among those injecting in public places over a two-year period to 2014.